There’s lots to do in Edmonton and area on and leading up to Halloween! Each year I put together a list to help you decide how to spend the spookiest month of the year. This is a selected list, with events that particularly interest me. I’ll add new ones to this list as information becomes available so keep checking back for updates – usually more events are announced closer to Halloween. Please leave me a comment below, send me an email or tweet me with any events you think should be added to the list! 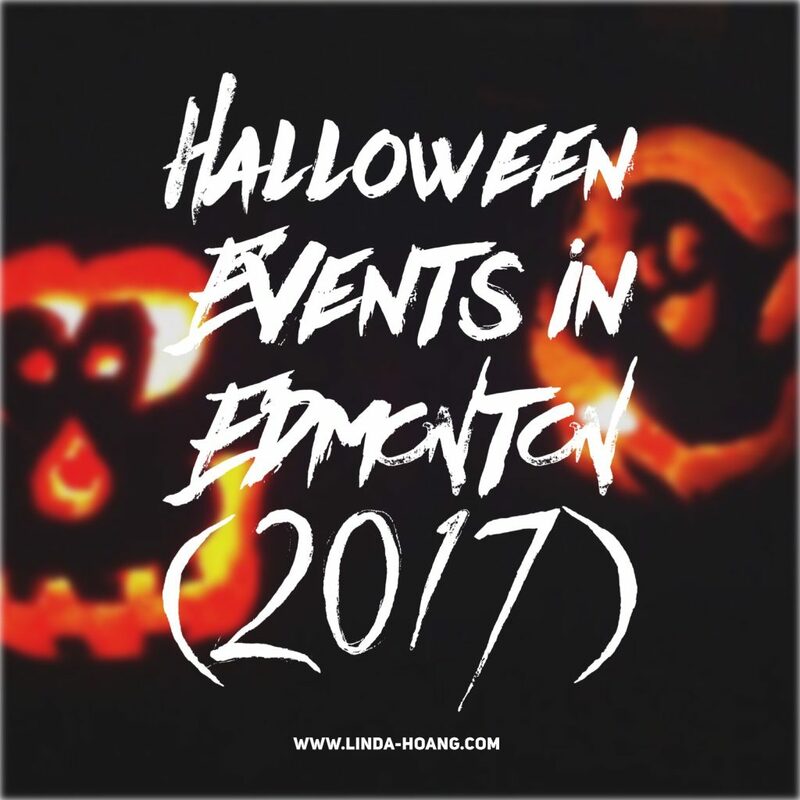 Pin + share my guide to Halloween Events in Edmonton! Details: The Summoning: Constructed in the early 1950’s, the Paramount Theater’s big screen entertained countless moviegoers both young and old. Sticky sodas, tangled film reels, chewed-up bubble-gum, and fetid floods caused by overwhelmed toilets are just some of the many messes dealt with by Frankie, the resident caretaker of the Paramount. Frankie loved the theater, choosing to spend his life cleaning up after grubby guests in the name of fantastic cinema; it is no secret that his labours continued in the afterlife. When the theater was sold over fifty-five years later, his soul was laid to rest, until now. The marquees are lit, the doors are open, but no longer do the stars of Hollywood grace his beloved silver screen. Deadmonton Haunted House calls the Paramount home for its third year in a row, and Frankie is not happy. Patrons have excitedly lined up not to revel in the glory of film, but to do little more than cause a ruckus. He has decided to summon ancient evils to drive away the current tenants. The summoning of his poltergeist pals is paramount to Frankie’s plan for eternal peace— no more queues, no more messes, no more insolent guests, and most importantly, no screaming in the theatre! Details: Edmonton Ghost Tours is offering a variety of Halloween activities throughout October including Halloween Pub Tours, Pub Walks, Trolley Tours, and a Medium Walk. Learn Old Strathcona history, true ghostly and non-ghostly tales of hauntings, murder, mystery, love & more. Date: October 28, 2017 – 6 to 10 p.m. Details: This Halloween, who’ll be “Scared to Death?” Murder Mystery Dinner includes: Halloween themed Murder Mystery during cocktails and dinner with seven professional actors dispersed amongst the guests incognito until…all hell breaks loose. Prize for winning solution and Delicious Buffet Dinner (tax and gratuity included). Date: October 19, 2017 – 7 to 10 p.m. Details: Are you afraid of the dark? Feel anxious in confined spaces? Does the thought or sight of spiders make your skin crawl? For most of us, there is one thing that inspires our deepest, darkest fears… On Thursday, October 19, guest experts will explore what fear is, why some fears are really common, and whether or not these fears are founded. DARK MATTERS ‘Fears & Phobias’ — not for the faint of heart! Date: October 27, 2017 – 8 p.m. to 1 a.m. Details: Join us in the Empire Ballroom for the Halloween Masquerade of the year! The spook will roll in and the mystery behind the mask will envelop you for the evening. The Phantom of the Opera will inhabit our corridors and possibly entice some of our other shadowed guests to come out of the woodwork in honour of the night! Tickets include: Late night bite | a spooky snack station. Entertainment and live music performed by: Carling Undercover. Costume contest: one prize for best dresses and one for best in theme; prizes will be announced night of the event. Date: October 14, 2017 – 7 to 10 p.m. Details: Find Halloween-themed inspiration through the animals around you while you cast a creative spell through a paint brush! Guided by an instructor, enjoy a glass of wine and some appetizers as you create your own animal-themed acrylic painting to take home with you. And of course, “Get Closer” to some of our spook-tacular creatures! Tickets are $75, and include a glass or two of wine, appetizers, painting instruction, and supplies. You will create a beginner or advanced cat. Date: Saturday, October 28 – 5:30 to 10:30 p.m. Details: Come enjoy biggest fundraiser of the year, the Halloween Extravaganza, and an opportunity to dress up your fur children for our sensational costume contest! Join us for delicious food and exhilarating fun on October 28th at the DoubleTree By Hilton West Edmonton. A delicious buffet dinner will be served, fantastic silent and live auction items will be up for grabs, entertaining games will be played, and exciting human and pet costume contests will occur! Daryl McIntyre (CTV Edmonton) will be sure to give you some great laughs emceeing the event! Date: October 28, 2017 – 9 p.m. to 2 a.m. Details: Will you be the life of the party or will this party be the death of you? When the mood is black and white and the morals are anything but—Dial R for Refinery at your AGA’s elegant Halloween party. Turn your martini glass into a magnifying lens, track down artful clues, solve a mystery and answer the question: will you be the life of the party or will this party be the death of you? Inspired by classic film noir themes, this Refinery late-night art party is all about the intersections between light and dark. The evening’s soundtrack provided by DJ Kris Harvey whose beats will have you cutting a rug all night long. Break out a fedora, seamed stockings, zoot suit, or vintage red lipstick and join us for a night of murderous intrigue at Dial R for Refinery, if you dare. Date: October 27, 2017 – 8 p.m. Details: 100.3 The Bear, Nitza’s Pizza Wye Road, and The Underground Tap & Grill Present… The 25th Annual Halloween Howler Featuring THE OFFSPRING With special guests One Bad Son, Comedy Daredevil Ryan Stock and AmberLynn and DJ Harman B. Best costume takes home $5,000 and an Arctic Cat VLX 700. PLUS, everyone who shows up is entered to win an all-inclusive vacation to Royalton White Sands in Jamaica, fueled by Sunwing.ca! Details: 5,000 people, 100 buses, 12 bars – Edmonton’s biggest Halloween party! Details: There are so many great escape rooms in Edmonton – many are spooky! Website: Various, my favourites are listed above but you can Google others! Date: October 28, 2017 – doors open at 7 p.m. Details: Beaumont Blues and Roots Festival Society’s 10th Annual Beaumont Best Halloween Bash. Location: Your house! Your friends’ house! Details: Mike and I have hosted a few Halloween parties and attended a few over the years and have attended friends’ parties. Check out this old blog post I did on Halloween-themed food and whip it up for any Halloween house parties you attend! DIY: How to Make an Instagram Halloween Costume (with Photoshop File)!!! DIY: How to Make a Snapchat Filter Costume (with Photoshop File)!!! Let me know if I should add any events!